Are you looking for beautiful solid wood chairs that provide the perfect complement to your kitchen or dining room table? The gorgeous Colorado Chair may be just what you need! The simplistic, yet elegant design of this expertly handcrafted chair makes it the ideal fit for just about any kitchen or dining room décor. Get the benefit of an heirloom-quality furniture piece that future generations of your family can enjoy as well. You have so many options when it comes to the design of your Colorado Chair. 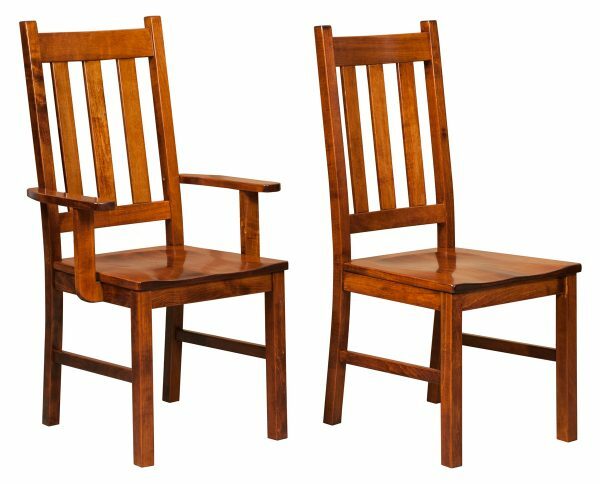 Begin by determining whether you want your chairs with or without arms, then select from a wide variety of sturdy hardwoods including oak, cherry, maple and quarter-sawn white oak. If you’d like to have chairs with a fabric- or leather-upholstered seat, you will have multiple choices available from Heartland Fabrics. Finish your customization by determining which of the many beautiful hardwood stains you prefer. Amish master crafters will then bring your unique design concept to life. Experience Fantastic Savings at AmishOutletStore.com! Shopping at AmishOutletstore.com is a great way to keep your furniture costs under control. Purchase your Colorado Chair right now and get up to 33% off the regular retail price! Combine your chairs with a new table and other kitchen or dining room furniture to take full advantage of our large order discount. Add the beauty of handcrafted solid wood to your home by purchasing your Colorado Chair today!